These packages are most suited to houses built before 1960's like the Victorian terraced, semi or detached houses with a purlin style roof. This sub-frame is made of timber, raised and strengthened and supported from structural areas to take the strain so very little weight is actually on your old ceiling. Most older properties of this era will require a new loft hatch installing to enlarge the loft entrance, make it open on a hinge or simply to improve what's already there. So we include this cost to remove your old hatch and replace it with a brand new compliant version. The cost is included in the prices below providing its a straight forward alteration in the same location. To move it elsewhere or create a new opening all together there will be an extra £60 for this service. The surveyor will advise you of this on his visit, which is completely free. Includes enlarging the existing opening. These packages are most suited to houses built after 1960's like the Victorian terraced, semi or detached houses with a purlin style roof and right up to the present day. 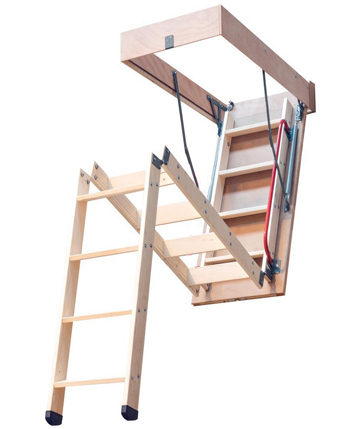 This sub-frame is made of timber, raised and strengthened and supported using a brand new unique adjustable heavy duty supporting leg called (LOFT-E™). 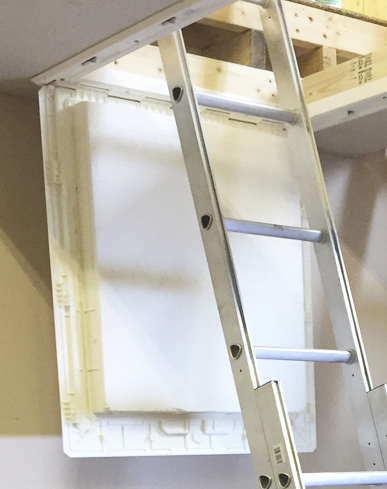 This will not only take the strain of your storage floor it will also allow you to have a raised loft floor fitted on a ceiling with uneven joists. because other loft leg style products are none adjustable and that mean having to pack and wedge to get them level, this is not idea. 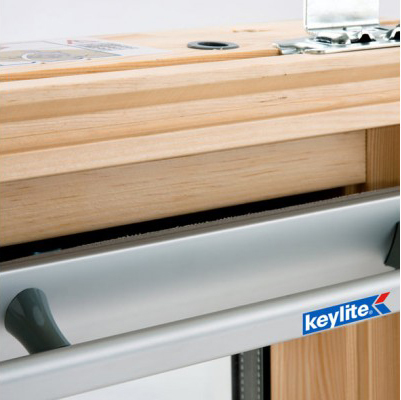 The LOFT-E™ raised loft storage floor leg is perfect for all uneven loft joists. Its also very strong and will take considerbale more weight than other methods. Also this system allows you to install a 270mm loft storage floor without compromising your loft insulation or your NHBC guarantee. 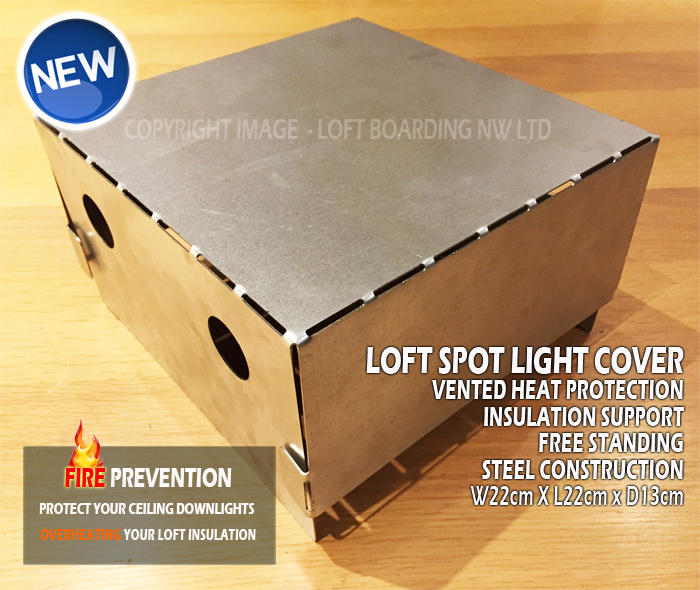 With this raised loft flooring system we include this cost of a fully strenghtened and raised loft sub-frame floor with hi-density boarding, a quality metal easy to use stow-away loft ladder and an energy saving LED loft light. 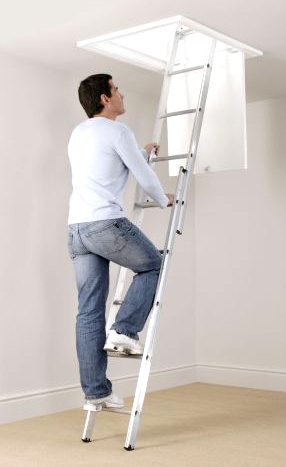 The quaified loft surveyor will advise you of on his visit as to what is possible in your loft, and it's completely free. We work with your budget and you are under no obligation to buy. 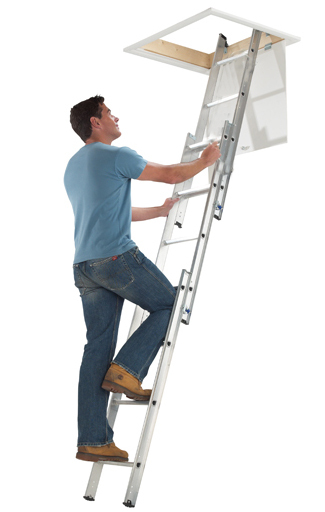 We only install the best top quality branded aluminium stowaway loft ladders. We do not use alternative cheap imports. 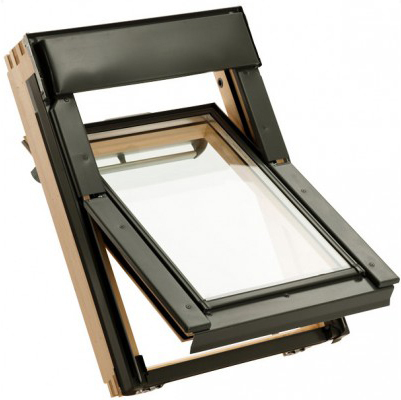 We are renowned for only installing top quality energy efficient loft hatches. We do not just reverse your old hatch door and hinge it. This is seen as a poor DIY method and is not going to help you save on your energy bill as they are not draft sealed, or insulated and do not conform to building regulation part L.
(Conservation of fuel and power). 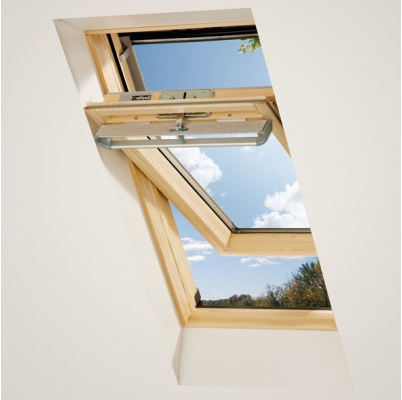 If you are going to spend money trying to make your home more energy efficient, then don't neglect the most important part which is your loft access. So much heat is lost through this area you would be quite shocked. We only install energy efficient loft hatches that conform to building regulations & British standards so as to help increase you home energy efficiency. We can do long timber hatches with timber ladders or the new build plastic type, either method is ideal for modern and older lofts spaces. Multi sealing locking points all the way around the hatch and fully insulated door. 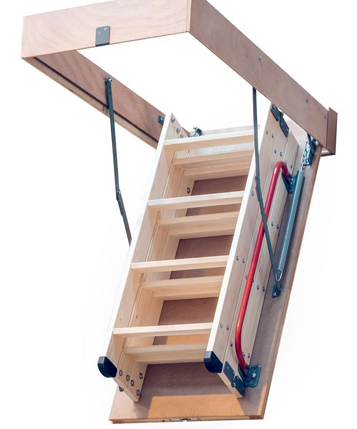 If you want to go that extra mile to give your self even more access room, them what about our best selling timber loft hatch and ladder kit? 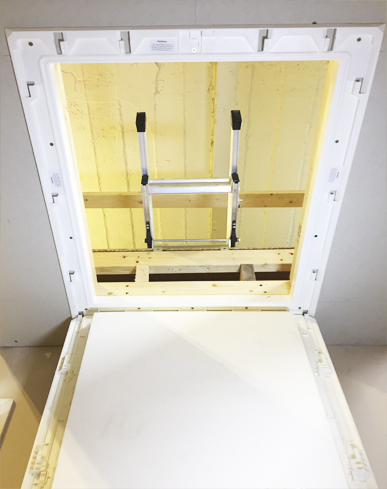 This factory made unit will hold the ladder on the back of the door for space saving, and can be designed and build to reach up to 3.5 metres. A spring assisted door helps with closing the door so it's not too heavy and the ladder simply folds up on the back of the door to stow away. The opening will be increased up to 1.1m long. Bespoke versions are available to be manufactured to your exact requirements. Prices vary and start from £350 installed depending on actual requirements and difficulty of installation. (All hatch options do require a survey to make sure they will fit). Fitted prices depend on roof type, window size and optional extras. We were the first loft storage solutions company in the UK to use LED loft lighting as standard. We believe that any small change will improve your homes energy efficiency, thus saving you money all year round, every little helps. 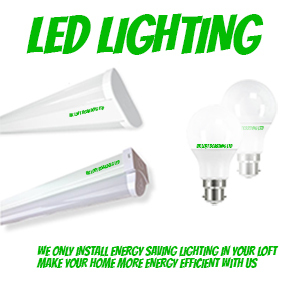 We install as standard LED energy saving bulbs and conveniently located light switch. Alternatively you can upgrade to a 4ft (1.2m) LED tube light to give more light to those darker areas and will only cost as little as £35 to upgrade on any package deal we offer. With the amount of installations we do in a year we probably save our customers 1000's of pounds every year on their energy bills, so that's why we are 100% dedicated to helping our customers get the highest energy rating in their loft spaces. It's cheap and we can top-up your insulation level if its low, it will pay for itself rapidly, and it will help you to feel warmer in the winter and cooler at night in the summer. 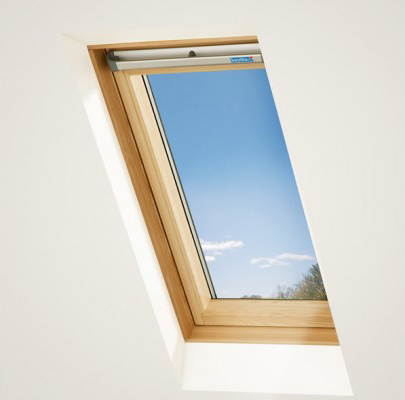 Did you know that millions of people in the UK haven't yet insulated their lofts to 270mm, and the two main reasons for this are the need for storage and safe access. Don't be one of them! 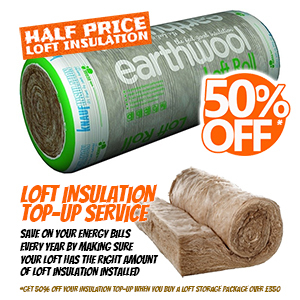 Insulating your loft adequately will save you a lot of money over the years. It's not expensive either, the average 2 bed terrace may only cost less than £250 with our discounts.